For PDF version of this Client Bulletin, click here. President Bush has signed into law the first legislative expansion of rights under the Family and Medical Leave Act since its enactment in 1993. The FMLA expansion is part of the National Defense Authorization Act for FY 2008 and will be enforced by the U.S. Department of Labor, Wage and Hour Division, which also enforces the “old” portions of the FMLA. Congress had passed the expansion legislation once before, at the end of 2007, as part of a defense appropriations bill, but Bush “pocket-vetoed” the bill for reasons unrelated to the FMLA provisions. It was widely known at the time that the FMLA expansion was down but not out -- Congress was expected to try again as soon as it reconvened in 2008, and Bush was known to be in favor of the expansion. The NDAA amendments create two new FMLA-qualifying events for eligible members of military families. One amendment to the NDAA provides for a one-time leave of up to 26 weeks during a 12-month period for spouses, parents, or children, or “next of kin,” to care for a family member who develops a “serious injury or illness” while serving in the military. This portion of the law is effective immediately. “Serious injury or illness” is defined as “an injury or illness incurred by the member in line of duty on [sic] active duty in the Armed Forces that may render the member medically unfit to perform the duties of the member’s office, grade, rank, or rating.” The DOL says that it will be “working quickly” to provide more specific guidance, but that in the meantime employers should respond in good faith to requests for this type of leave and should follow the “old” FMLA regulations regarding notice requirements, substitution of paid leave, and the like. Another provision of the new law provides leave rights for a “qualifying exigency” to spouses, parents, or children of service men and women who are “on active duty (or [have] been notified of an impending call or order to active duty) in the Armed Forces in support of a contingency operation.” This portion of the law is not effective until the DOL issues regulations defining “qualifying exigency,” so employers can breathe easier about that provision . . . maybe. The DOL warns that it “is expeditiously preparing such regulations” and recommends in the meantime that requests for such leave be granted (even though we are waiting to learn what a “qualifying exigency” is). Reserve and National Guard duty is covered under both of these provisions. 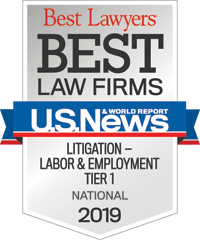 If you need assistance complying with the new provisions of the FMLA, please contact any member of Constangy’s Litigation Practice Group or the Constangy attorney of your choice. Constangy, Brooks & Smith, LLC has counseled employers, exclusively, on labor and employment law matters since 1946. The firm represents Fortune 500 corporations and small companies across the country. More than 100 lawyers work with clients to provide cost-effective legal services and sound preventive advice to enhance the employer-employee relationship. Offices are located in Georgia, South Carolina, North Carolina, Tennessee, Florida, Alabama, Virginia, Missouri, and Texas. For more information about the firm's labor and employment services, visit www.constangy.com, or call toll free at 866-843-9555.